fresh boiled egg, adding Skipio’s Egg Meal will give it the dry, crumbly consistency that most finches desire. An added bonus about this egg meal is that it is made from ground seed, the same seed that your birds would normally eat…ground millet seed. There are no dried bread fillers. Additionally there is dried egg yoke, spirulina and aniseed as well as dehydrated ground insects to increase the protein content for growing chicks. 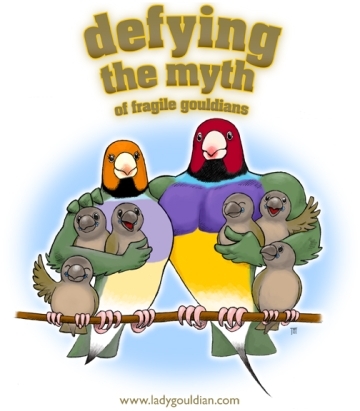 The Egg Meal that I sell has no soya protein that may interfere with fertility in breeding birds. I do not recommend this product be used as a hand-feeding formula for small birds, because I feel that the consistency would be too bulky to feed through a syringe. If you are hand-feeding a larger bird with a spoon, I believe it would work very well. 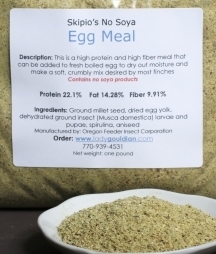 Ingredients: Ground Millets, Dry Egg Yoke, Dehydrated Insect (Musca Domestica) Larvae and Pupae, Spirulina and Aniseed.